This is the second part of the Golden Jubilee Buses feature and specifically covers RT4172, mainly working the 6 route. For the Golden Jubilee, RT4172 worked the 6, 38 and the 73 plus the Jubilee bus parade. Several Jubilee Bus Tours were undertaken too covering various London bus routes and destinations with the RT. I believe the 6 route was the only one the RT bus had a full set of blinds for. On the 38 and 73 it did have a full set of intermediate blinds however the main destination was simply displayed as ‘Special Service’ at both the front and rear of the bus. It ran on the 38 in June 2002 and the 6 in August 2002. I was able to get some timings from the bus crew so could see the vehicle at many points along the route between Willesden bus garage and Aldwych. It seems the 6 was the only one to have two Golden Jubilee buses operating on the same day! Both RML2431 and RT4172 were seen on the route, in fact RML2431 was working the service in front of the RT so I was able to photograph two Golden Jubilee Buses at Warwick Avenue within a few minutes of each other. However I did not see the two together en route. The one difference between the RT and the other Golden Jubilee buses is the RT had a Golden Jubilee roundel on it’s rear off side corner. TBH the Golden Jubilee livery was a bit inconsistent. 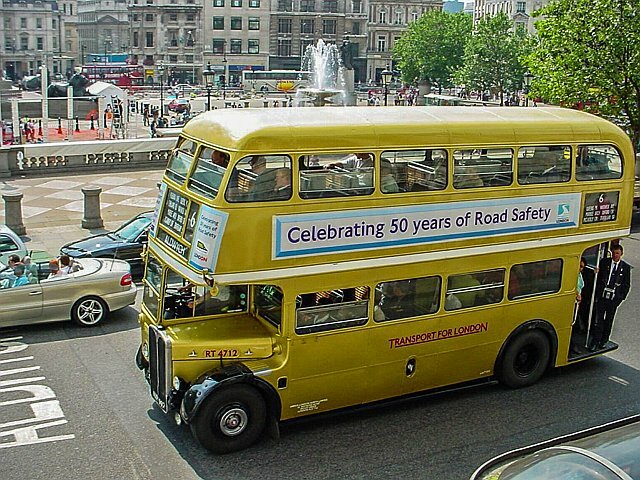 Some buses had all over gold, others had the white band around the upper centre of the bus as is normal practice, and RT 6 actually began its Golden Jubilee in this state. On the north side of Trafalgar Square – a scene that no longer exists! In 2003 RT6 was painted with a purple band in place of the white. In retrospect somewhat odd because the Golden Jubilee had finished! It should have been the other way round! RT4172 also acquired a purple band during 2003! 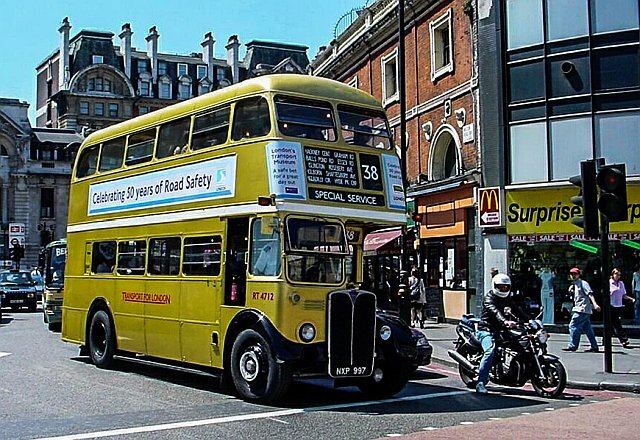 If that was any sort of ‘official’ Golden Jubilee livery, clearly not one bus garage bothered with it at the proper time, thus any preserved or show bus that now sports a purple band is carrying an incorrect livery. The picture of the RT with ‘tour’ were from 14 May 2003. I’d just got off the Bakerloo at Charing Cross and the stairs into the Strand when I spotted the RT. Next Post: Mind those indicators!